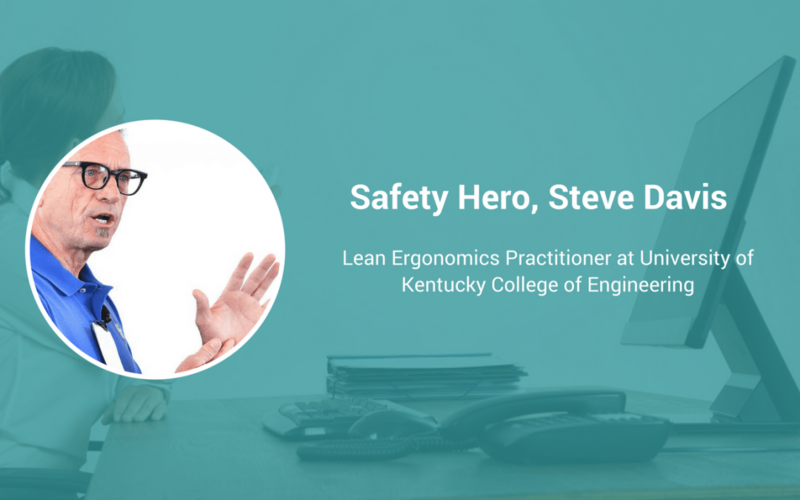 Steve Davis, Lean Ergonomics Practitioner with the University of Kentucky’s Lean Systems Program, is dedicated to helping organizations and business leaders improve worker behavior and culture. Davis teaches the Lean Ergonomics Certification Course where he helps people understand ergonomics and process inefficiencies (among other concepts). Davis is a genuine, respectful, caring, and high-energy leader who is successfully transforming lives and communities—and in the process, he’s helping businesses to increase efficiency, productivity, and quality through his unique ergonomics approach. “One third of all injuries and illnesses and 40 percent of all workers’ compensation claims are caused by the ergonomic failure of an operating system. It’s an efficiency issue,” Davis tells us. Keep reading to see more of his story, including how he predicts safety will evolve, and the surprising situation—an injury—that’s shaped his approach to work. I went back to college at age 29. I had had a few years to get out and work in various industries. I was fortunate enough to have been immersed in the initial launch of ISO-9000 as a quality systems auditor. I saw how companies with good quality systems could use this to build in injury/illness prevention by developing systems that keep risk factors out of processes…everything is a process. The risk factors that can’t be prevented from entering processes can be addressed through robust systems as well, in fact it’s the only way to maintain process control. I decided to specialize in ergonomics while working as a S&H Director for a large multinational. We would have an incident, hire a consultant to come in and identify risk factors and make some recommendations and leave until the next symptom reared its ugly head. I knew that the only way to solve this problem was to address them by affecting the systems. That’s what Lean Ergonomics does, and the University of Kentucky and Toyota are the best on the planet at Lean. I’m both grateful and humbled to be part of this program. Active caring, being a good listener and a willingness to develop a well-trained and educated workforce with respect to safety and health. With this realization, and that safety and health standards are in place because of recognized hazards, they can then make a decision to behave safely, which would eliminate the 90-95% of injuries/illnesses attributable to people deciding to take risk. I genuinely care about humans, their families and the communities that they live in. The future of safety and health management is going to follow the age demographics as it correlates to the number of jobs and the year 2025 is the magic year for the U.S.
A baby-boomer (1946-1964) turns 50 every eight seconds in the US. As this huge population retires and job market grows there will not be enough employees to fill the human resources requirements, even with AI and automation. Even at today’s 4% unemployment rate, entire industries are struggling to find skilled and unskilled employees. For example, the construction industry currently has between 180,000 – 200,000 unfilled, high-paying, skilled jobs open which is already causing problems within this industry. As the employee shortage becomes more pervasive, the safety culture will transition from compliance-driven to survival-driven. Organizations that recognize that their most valuable assets are their employees will flourish and dysfunctional organizations that allow petty tyrants and bullies to manage their businesses will suffer from economic Darwinism and perish as employees migrate to work cultures and environments that value them.